I will need several people to fill in the scenes around the W.i.t.c.h. girls and main happenings so I've decided to do castings. That means you can apply as yourself, with your OC or any character from your favourite series. Just make sure to read the specifications and rules of each casting. Most roles will be silent (no speaking text) and in the background of the scene. In the movie industry we call these people "extras". Sitting in a café, class room or walking down the street are good examples for roles. Should you not have been picked in one casting, you can still enter the next and the next, until you made it. If you entered several castings, without making it into the comic, please notify me so I can keep a look out for your entries. I'll draw you/your character without you having to pay me for it! WOHO! You will get a singled-out version of the panel you appeared in, exclusively! 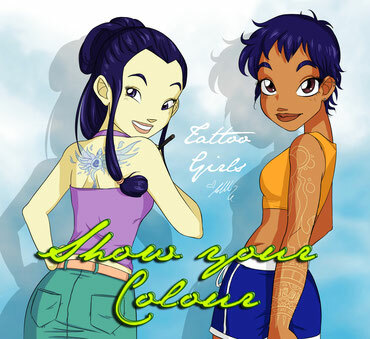 I happen to know that some of you guys have some amazing Tattoos of W.i.t.c.h! Since I think that is absolutely amazing, I want to feature as many tattoos as possible in my comic. So, if you have a W.i.t.c.h. tattoo, go show it to the world! Send me a picture of yourself with your tattoo, along with your name and website/instagram/DA account! Number 12 will be substituted by ticket number 5! Congratulations! so: HOLD ON TO YOUR TICKETS, FOLKS! You might just need'em in a few days. 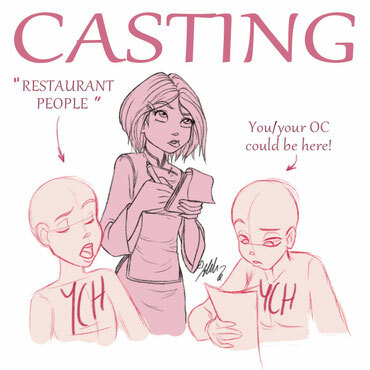 Character Requirements: 4 females and 4 males. Age range from 13-50. Clothes can be business, school /uniform or everyday-casual. NOTE: Please don't send me any pictures or character info until I ask you to! 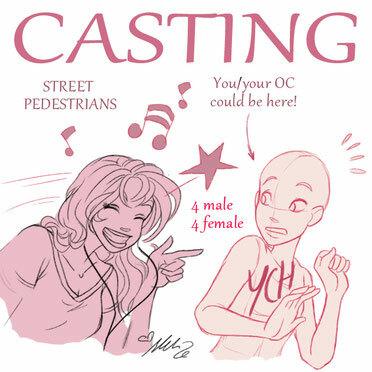 Leave a comment below, on DA or Instagram stating the gender of yourself or the character you want to apply with. You can apply both once for female and male (or just one) but NOT twice for a gender. I will give you a ticket number for either the male or female ticket pool. On the 23rd, I will draw the winning numbers from both pools and notify the equivalent applicants. In said note I will ask you for the reference pictures of yourself or your character. I need a picture of the face, hair and clothing. Please only send me one outfit and one hairstyle you'd like your character to have in the scene. After receiving the reference pictures, I will assign the person or character a role in the scene and describe it to the applicant. He/she can then decide again to accept that role or not. Should a person or character not qualify for the scene or not accept the role I assigned them, the position will be taken up by another draw from the equivalent gender pool. The former applicant is of cause still free to enter any castings in the future in hope for a better role. Not every casting will be a lottery draw like this one. Please read each rule and process set carefully before you apply for a casting. Either two females, or one female, one male. Age is unimportant. Clothes should be everyday-casual. Thanks to Eua Kotsou & Ecmel soylu for volunteering!